On November 11, the National Coalition for Syrian Revolutionary and Opposition Forces was established in Qatar, supposedly to lead the struggle against Bashar el-Assad. While not an insignificant event, the truth is that these exiled dissidents now have very little influence over the uprising. With Syria in a state of civil war since about a year, opposition leadership has drifted away from the politicians and diplomats, into the hands of guerrilla leaders. Among these armed groups, things are taking a nasty turn, with the uprising’s sectarian character growing more apparent by the day. The regime is dominated by Syria’s religious minorities, particularly Assad’s own Alawite sect, while the vast majority of revolutionary activists hail from Sunni Arab majority. The exiled opposition retains a small number of Christian, Alawite and Druze leaders, but there is far less pluralism among demonstrators and rebels inside Syria; the armed resistance is almost exclusively Sunni Muslim. This does not imply that all rebels are religiously motivated, since Syria’s sectarian dynamics are more a question of familial background than one of personal faith. But Islamism is gaining ground rapidly within the armed movement, as rebels grasp for ways to stake out their identity, formulate an ideological discourse, and privately seek solace with God. By November 2012, the ideological spectrum of Syria’s armed movement had narrowed to one ranging from apolitical Sunni conservatism or rural sufism, across the Muslim Brotherhood’s ikhwani Islamism, to the rigid ultra-orthodoxy of salafism. There was little or no room for secular ideologies. Most of the armed units in Syria self-identify as part of the Free Syrian Army (FSA), a sprawling ”network of networks” which is backed by the USA, France, Qatar, Saudi Arabia and Turkey, among others. Since its emergence in summer 2011, the FSA has seen a number of rival leaderships emerge, but in September 2012, a ”Joint Command” was presented by Col. Mithqal Bteish el-Noaimi at a conference inside Syria. This group is now popularly seen as the ”mainstream” FSA. The September conference also featured a speech by Adnan al-Arour, a popular Saudi-backed Syrian salafi. It was indicative of the slow convergence of FSA brigades around a nationalist-Islamist line of thought, as secular activism is squeezed out of the uprising entirely, while more radical groups drop off the other end to form their own alliances. The FSA is not the only player around, however. Just before the Joint Command was formed, several factions on the fringes of the FSA united under the banner of the Syria Liberation Front (SLF). While it has gone almost unnoticed by the foreign media, the overtly Islamist SLF overshadows the FSA in some areas of Syria. It includes powerful units such as the Farouq Brigades of Homs, the salafi-leaning Suqour el-Sham Divisions of Idleb, and the Ansar el-Islam alliance, which dominates the insurgency around Damascus. Many of the independent groups are able to turn down support from the FSA network, since they have other sources of funding. These include donations from individual states and private Islamic charities. The wealthiest such charities are funded from the Gulf and run by salafi preachers, like the Syria-born scholar Mohammed Surour Zein el-Abidine. Another major non-state funder is the Muslim Brotherhood, often described as Syria’s largest opposition group. The Brotherhood lost most of its cadre inside Syria during a failed 1980s uprising, but its exiled leadership is now frantically trying to rebuild an internal structure. While comparatively weak on its own, the Syrian Brotherhood can draw on the financial resources of a vastly larger global network of ikhwani mosques, parties and preachers, as well as the support of governments such as Qatar, Egypt and Turkey. There are good reasons for this prudence. While the private salafi and ikhwani contributions have been immensely helpful in weakening the Assad regime, they are viewed with suspicion by many Western and Arab governments, who fear a jihadi ”blowback” from the Syrian conflict. Several Gulf states have clamped down on private funding of the rebels, insisting that all support must go through government-approved channels. For example, in May 2012 Saudi Arabia banned a charity called the Ulema Committee to Aid Syria, fronted by the popular salafi preacher Mohammed el-Arifi. The international concerns focus in particular on a shadowy salafi-jihadi group called Jabhat el-Nosra, which emerged in Syria in early 2012, probably as an outgrowth of the Iraqi wing of al-Qaida. It has specialized in suicide attacks against high-profile government targets, earning it a great deal of media attention. There is also the Ahrar el-Sham Brigades, a less famous but larger salafi group, which is well implanted in north-western Syria. Like Jabhat el-Nosra, it has enrolled foreign volunteers, engaged in suicide bombings, and seeks to establish a theocracy, but it still appears somewhat less extreme than Jabhat el-Nosra, and has a weaker connection to the international salafi-jihadi scene. Ahrar el-Sham funding sources are diverse, but known to include Gulf-based salafists such as the Kuwaiti sheikh Hajjaj el-Ajami, and even the Muslim Brotherhood. 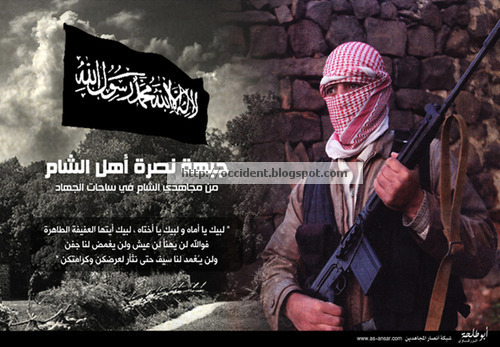 Numerous smaller jihadi factions are active on the local level. For example, the Haqq Division alliance gathers radical Islamist groups in Homs, while the small town of Binnish, on the strategic Idleb-Aleppo road, has spawned a salafi network known as the Islamic Vanguard Group. Ultimately, the jihadis are only one strand within a larger Sunni insurgent movement, even if they play an outsized political role, by pushing the parameters of the conflict towards sectarian violence and coloring international perspectives on the uprising. And however unpleasant its effects may be, the primary danger in Syria is not the short-term rise of Islamism – it is the risk of a national collapse into anarchy, and protracted sectarian violence. Should this be allowed to occur, jihadism will be the least of the Middle East’s troubles. *Aron Lund is author of a report on Syrian jihadism for the Swedish Institute of Foreign Affairs, a shorter version is at Foreign Policy: “Holy Warriors: A field guide to Syria’s jihadi groups,” He also is author of Drömmen om Damaskus (“The Dream of Damascus”) and a regular contributor to Syria Comment. Assad obviously created Jabhat el-Nusra to scare off the West, right?